Lee County Commissioners are expected to approve improvements to Hertz Arena's roof. The proposal says the roof has to be up to code because the arena is used as a hurricane shelter. UPDATE (11AM) -- County commisioners approved a $3.2M project providing design and construction updates to the Hertz Arena roof. The $3.2 million project will be funded by $2 million from the Lee County’s All Hazards Reserve Fund, $1 million from the General Fund and the balance from major maintenance funds. The Walker Contracting Group, Inc. is the contractor for the project. Improvements to the arena include design and repairs to the roof and other necessary measures to withstand hurricane winds. Work is anticipated to begin in March and be completed in June, weather permitting. ESTERO, Fla. -- Lee County Commissioners are expected to approve improvements to Hertz Arena's roof. The proposal says the roof has to be up to code because the arena is used as a hurricane shelter. 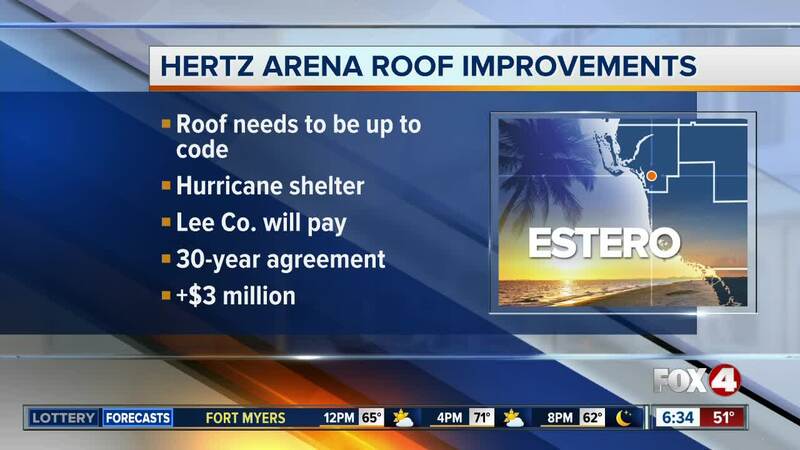 Lee County will pay for the new roof, because the owner of Hertz Arena, has agreed to let the county use the arena as a hurricane shelter for another 30 years. Construction on the roof would start in March of next year and be completed in June. The estimated cost is more than $3,000,000. Only about 14% of the building will be yellow. It will take about six weeks to finish painting. It was take a little longer to get the Hertz lettering installed on the building. The work will not affect any hockey games or concerts.